As you may probably know, I love gardening with my two girls, Lara and Holly. Admittedly, most of our gardening activities are fruit and vegetable related and at present we're enjoying harvesting tomatoes, potatoes and summer broccoli. Something I'm never that green-fingered with is flowers. Comfort Intense sent Holly her own little floral gardening kit to help encourage her to plant some flowers in our garden to celebrate the launch of the new Comfort Intense fragrances. Holly planted her first seeds a couple of weeks ago and now her seedlings are just about ready to plant out. Earlier this month Comfort Intense briefly appeared in a pop-up floral garden in Covent Garden launched by Kimberley Walsh and made entirely out of freshly washed clothing! Holly's garden may be a long time in the making but I'm already impressed by the strong fragrances of Comfort Intense that pack a powerful punch in their little bottles of fabric softener. One of the fragrances in the Comfort Intense range is Fuschia Passion - fuschias are one of my all-time favourite summer flowers with their stunning bright pink and purple delicate blooms. My absolute favourite scent from the range is Sunburst which we are currently using in our family wash - everything comes out with a really uplifting summery scent which puts a smile on my face. 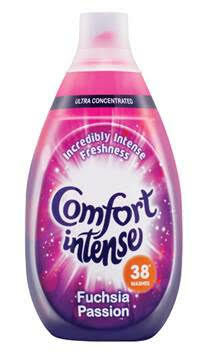 One bottle of Comfort Intense contains enough concentrated fabric softener for 38 washes (the RRP is £3.30).